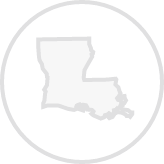 Create a legally binding Louisiana Bill of Sale with our attorney-drafted template! What Is a Louisiana Bill of Sale? A Louisiana bill of sale is a document that proves the exchange of legal ownership of an item between a buyer and a seller. Some Louisiana bills of sale must be notarized. It's important that the buyer and the seller do not sign the document until they are in front of the notary. What Are Some Common Bills of Sale Used in Louisiana? In Louisiana, the most common bills of sale that are used are a general bill of sale, a bill of sale for a motor vehicle, a bill of sale for a boat, and a bill of sale for a gun. How Do I Write a Louisiana Bill of Sale? Because a Louisiana bill of sale documents the transfer of legal ownership from the seller to the buyer, there's certain information that the document must have. Although a bill of sale isn't legally required to sell most personal items, it is still an important personal record because it can prove who has the right to possess an item. All Louisiana bills of sale need to have specific information about the buyer and seller, information about the item being sold, the price, any extra conditions of the sale, and the signature of both parties. There are specific pieces of information that must be included in the most commonly used bills of sale. First, you'll read about the information that belongs in all bills of sale. Then, you'll learn about the information that is unique to the most common bills of sale. A Louisiana bill of sale needs to have the date that it was created. It will also need the date that the buyer pays for the item, especially if the buyer doesn't pay for the item on the day that the bill of sale was created. The signatures of both the buyer and the seller will also need to be dated. Next, you'll need to include the full legal name, physical address (including city, state, and zip code), and either the driver's license number or the state identification card number of both the buyer and the seller. While it's not a legal requirement to have a valid driver's license number or even a state identification card number, it is beneficial to have if a legal dispute arises related to the item. It helps prove the identity of the parties entering into the agreement. You'll need a description of the item being sold. The exact information you'll use will depend on the type of Louisiana bill of sale you're writing. Commonly included pieces of information include the serial number, registration number, make, model, year, and color of the item. You'll explain the payment made for the item. If the item is given as a gift to the buyer, you should mention that in the bill of sale. Trades are also common. For a trade, you'll detail the item that's being traded. For monetary payment, the amount should be listed in words and then in numbers. For example, two-hundred and seventy-five dollars and fifty cents ($275.50). While not legally required for every Louisiana bill of sale, you should include a seller's disclosure. A seller's disclosure explains any known defects to the buyer before the purchase is complete. It's important to note that when the seller signs the bill of sale, they are promising that the information in the bill of sale, including the information listed in the seller's disclosure, is true. Finally, the bill of sale should be signed and dated. Some Louisiana bills of sale should be notarized. If you're using one that must be notarized, the buyer and seller should not sign and date it until they are in front of a notary. A Louisiana general bill of sale is used for the selling of common personal items such as a laptop, iPod, television, dining room set, bicycle, or even a musical instrument. When you're drafting a Louisiana general bill of sale, you should make sure that you clearly describe the item. To do this, you should list any known serial or registration number, make, model, or year of the item. You could also list the color or size. For example, you were selling a queen size bed frame with mattress and box springs, you could describe it in detail: "Queen size bed frame with cherry headboard and matching footboard, along with a two year old mattress and box springs." In the seller's disclosure, remember to list any known defects of the item being sold. For example, if you sold your older flat screen television and you know that occasionally the sound stops working, you'd want to inform the buyer of that in the seller's disclosure. Because a Louisiana general bill of sale covers common items, it does not need to be notarized. 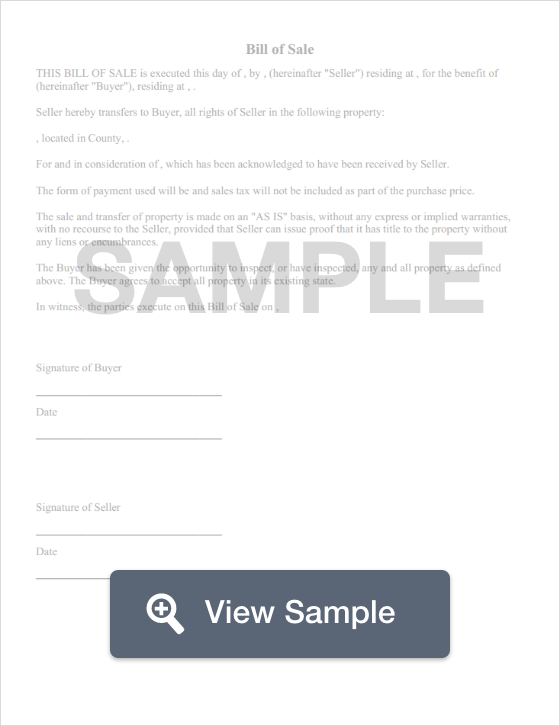 Both the buyer and the seller should keep a copy of the completed bill of sale. A Louisiana bill of sale for a motor vehicle must list the Parrish where the sale took place. The required information for the vehicle being purchased is the make, model, year, and VIN. In addition to the bill of sale, you'll need to complete the Vehicle Application Form DPSMV1799. Make sure that you complete the form in its entirety or it will be rejected by the Office of Motor Vehicles. If the vehicle is under ten years old, you'll also need to provide an odometer disclosure statement. A Louisiana bill of sale for a motor vehicle should be signed by the buyer and the seller in front of a notary. A Louisiana bill of sale for a boat must have certain information. That information includes a registration number (if the boat was previously registered), the model, the manufacturer or make, and the Hull ID. Sometimes a trailer or an outboard motor will be included in the boat sale. So, a Louisiana bill of sale for a boat should state whether a trailer and / or outboard motor is included. If a trailer or motor is included, you should include a description that includes the year and make. For motors, you should specify how many motors are included and the horsepower in addition to the year and make. The bill of sale should also include a statement by the seller that there are no liens or any other sort of legal encumbrance. Finally, the bill of sale should be signed by the buyer and seller in front of a notary. A Louisiana bill of sale for a gun is an important personal record. Because guns are often traded, it's important to include the proper information about the gun that's being traded. The information you should include in the bill of sale is the make, type, caliber, and serial number. You should also document whether the sale includes any sort of accessories, such as a holster or case. Remember that a seller's disclosure should be used to explain if the gun has any known defects. A Louisiana bill of sale for a gun should be signed by both the buyer and the seller. It's not legally required to have the document notarized, but that could be useful if a legal issue arises over the gun in the future. Both the buyer and the seller should keep a copy of the completed bill of sale. Is a Louisiana Bill of Sale Required to Register a Vehicle? Maybe. It depends on the circumstances of the sale. If you're buying a vehicle from a private individual, you won't need a Louisiana bill of sale to register the vehicle if the title is notarized, lists the mileage, and lists the purchase price. Although a Louisiana bill of sale isn't always required, it's an important document to have because it proves that the vehicle was sold. The registration process is completed through the Office of Motor Vehicles. You'll need to complete Vehicle Application Form DPSMV1799, bring your photo ID, have proof of insurance (unless you purchased the vehicle from a dealership), bring a valid inspection certificate, have the title signed over to you by the previous owner, a copy of the vehicle's current registration, a UCC-1 Financing Statement if the vehicle is being financed, an odometer reading in miles if the vehicle is under ten years old, and be ready to pay the required taxes and fees. Is a Louisiana Bill of Sale Required to Register a Boat? Yes, if the boat is purchased from a private individual or an out of state dealer, you will need a notarized bill of sale to register your boat in Louisiana. Boat registration is completed through the Louisiana Department of Wildlife and Fisheries. You can apply in person or mail in your documents. For boats purchased new from a Louisiana dealer, you'll need an original Manufacturer's Statement of Origin (MSO), a copy of the dealer's invoice, and proof that local taxes were paid or a completed original Tax Payment Certification Form R-1331. For boats purchased from private persons, you'll need the title, registration, and a notarized bill of sale for a boat. The State of Louisiana provides a bill of sale for boats and motors. For boats purchased from a dealer not located in Louisiana, what you'll need will depend on whether it was previously registered. For previously registered or titled boats, you'll need an invoice from the dealer OR a notarized bill of sale, the title or registration, and proof of ownership from the titled owner to the dealer. 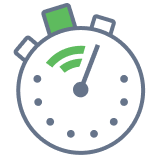 For first time registrants, you will need to provide a completed original Tax Payment Certification Form R-13331. You must be prepared to pay the fees associated with registration. Is a Bill of Sale Required to Register a Gun in Louisiana? No. Guns are not registered in Louisiana. A Louisiana bill of sale for a gun is an important personal record that should still be used despite the fact that it isn't required for registration purposes. Create a free Louisiana Bill of Sale in minutes with our professional document builder.